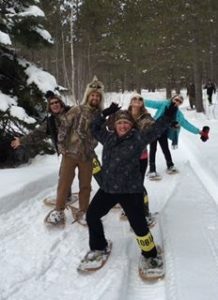 Weekly Snow Shoe Walks/Each week is a different location with a social after. January 2nd Mark Fitting Annual Memorial Walk, Starting at Michigan Information Center, Sponsored by Pit Stop. January 9th. Bessemer walk meet behind City Hall at Iron Belle Trail Head Sponsored by Bessemer VFW. January 16th. Cottonwood tree walk sponsored by Manny’s Restaurant. January 23rd . Gogebic Country Club sponsored by Elk & Hound. January 30st. Miners Park Red Devil Loop Ironwood sponsored by Rigoni’s Bar. February 6th. Corullo’s House 5361 Spring Lane Rd. sponsored by Don & GGs. February 13th Schaumburg Park sponsored by ?????????????. February 20th. Stan & Sue Carr’s House Walk sponsored by Powderhorn. February 27th. ABR walk sponsored by Golden Dragon. March 6th. Miners Park Pabst Blue Ribbon Loop sponsored by Cold Iron Brewery.